Abingdon, VA -- The Crooked Road, Virginia’s Heritage Music Trail, has announced a stellar lineup of artists for the 34 concerts of the first-ever Mountains of Music Homecoming, June 12-20 in Southwest Virginia. Over 200 artists will perform at 34 Crooked Road Concerts located in cities and towns all across the 8,600-square-mile Crooked Road Region. This very special nine-day event features over 260 additional cultural experiences presented by local communities and organizations highlighting the culture of scenic Southwest Virginia. Hiltons, VA -- Whitetop Mountain Band is a family-based band from the highest mountains of Virginia. Whitetop is an area rich in old time music tradition, and this band has deep roots in mountain music. The band’s members have worked tirelessly to preserve the region’s style of old time fiddling and banjo picking and are legendary musicians and teachers of the style. Their shows are high energy and unlike any other show you have ever seen. There’s everything from fiddle and banjo instrumentals to powerful solos and harmony vocals on blues, classic country, honky tonk, traditional bluegrass numbers, old timey ballads, originals, four-part mountain gospel songs – and some flat foot dancing. Well-known for their charisma on stage and their ability to engage audiences of all ages, this group has been performing at the Carter Fold since shows first began at the A.P. Carter Grocery in the 1970s. The Crooked Road: Virginia’s Heritage Music Trail proudly presents a Youth Music Series concert on Thursday, December 13th at 6:00 p.m. at Heartwood: Southwest Virginia’s Artisan Gateway. The concert will feature the Tower Street Stringband. The Crooked Road Music Series features youth music performers, as well as showcasing venues of the Crooked Road region. Heartwood features open jams on the 1st, 3rd, (and 5th) Thursday of every month. A complete schedule for the music series is available on The Crooked Road website at www.thecrookedroad.org. Abingdon, Va.— National Endowment for the Arts (NEA) Chairman Rocco Landesman announced today that The Crooked Road: Virginia’s Heritage Music Trail is one of 832 non-profit organizations nationwide to receive an NEA Art Works grant. The Crooked Road (TCR) is recommended for a $10,000 grant to support traditional music education in Southwest Virginia. The Grundy Jam in Grundy, Virginia will be presented with a banner acknowledging this venue’s recent inclusion as a Crooked Road Affiliated Venue. As an Affiliated Venue, the Grundy Jam will be represented in Crooked Road publicity and promotional materials. The Crooked Road will present the banner to representatives of the Grundy Jam on Tuesday, November 13, at 6:30 p.m.
At 7:00 pm on Thursday, October 25th, the Willis Gap Community Center Open Jam from Patrick County, Virginia will be the featured Venue Showcase at Heartwood. “As sometimes happens, these Jams grow from modest beginnings,” says Jack Hinshelwood, executive director of The Crooked Road. “This one started back around 1995 when friends of Nellie and Otto Hiatt would gather for music in their home. To accommodate all the folks that wanted to hear and play the music, it was moved to the Community Center but it still retains that welcome to our home atmosphere”. Abingdon, VA- The first weekend in October, the air will be filled with the sounds of bluegrass and traditional music in Abingdon. As The Crooked Road: Virginia’s Music Heritage Trail and the Town of Abingdon team up to host this first ever Crooked Road Music Festival that will feature musical performances, workshops and competitions. Lambsburg, VA -- The Lambsburg Community Center Jam in Lambsburg, Virginia will be presented with a banner acknowledging this venue’s recent inclusion as a Crooked Road Affiliated Venue. As an Affiliated Venue, the Lambsburg Community Center Jam will be represented in Crooked Road publicity and promotional materials. The Crooked Road will present the banner to representatives of the Lambsburg Community Center on Friday, September 21. The Lambsburg Community Center Jam was organized in September of 2007 and has been running every Friday night since it began. Each Jam session includes old time and bluegrass musicians from all over to make the Center a great venue for good clean fun and relaxation every Friday night from 7:00 – 10:00 pm. Concessions are sold to assist in keeping the Community Center open. Admission is free and all musicians are welcome. Abingdon, VA -- The Crooked Road, in partnership with the Town of Abingdon, will present a Youth Music Showcase to kick off the first ever Abingdon Crooked Road Festival. On Friday, October 5th, 2012, at 7:00 p.m. at Latture Field in Abingdon, the festival will open with performances by three outstanding regional youth groups: The Wright Kids, Adam McPeak & Mountain Thunder, and The Iron Mountain Ridgerunners. Wytheville, VA -- The Wytheville Community College (WCC) Bluegrass & Old-Time Jamboree in Wytheville, Virginia will be presented with a banner acknowledging this venue’s recent inclusion as a Crooked Road Affiliated Venue. As an Affiliated Venue, WCC Bluegrass & Old-Time Jamboree will be represented in Crooked Road publicity and promotional materials. The Crooked Road will present the banner to representatives of the Bluegrass & Old-Time Jamboree on Saturday, September 15, at 7:00 p.m. The Crooked Road: Virginia’s Heritage Music Trail proudly presents a Crooked Road Youth Music Series concert on Thursday, September 13th at 6:00 p.m. at Heartwood: Southwest Virginia’s Artisan Gateway. 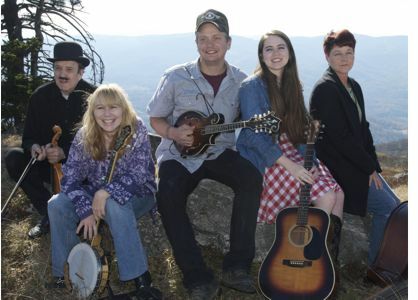 The concert will feature the Yates Family Band and Raisin’ Cain. Acoustic, mountain and bluegrass music will be performed throughout the concert series.